We’ve all been spiritually hacked!! In my last post, I shared some thoughts on the need to perform a Spiritual Audit regularly, a self-assessment as to the condition of our hearts, our thoughts, our behaviour, and our relationship with God. This is especially valuable during times of suffering, because it supports our willingness to trust that God is using our suffering for our spiritual success and not as some form of twisted vengeance. Just as we give our computer a scan when it shows signs of not working correctly. Are we afraid of the judgemental eye of the technician, wondering what we have been up to cause a virus to access our computer? Do we just ignore the virus out of fear of discovery? Usually we see the technician not as someone to fear, but rather someone to detect the problem and give us the solution. Much in the same way as God can for us, through our spiritual audits. Similar again to computers, a spiritual audit is required regularly, no matter how long we have been believers, and regardless whether we have had our sins cleansed once, or perhaps many times in the past. The reason for such scrutiny is because as long as we walk this earth we are exposed to sin. Sin has a viral effect upon the condition of the world through us, and the weakness of our flesh. We become exposed to sin, which creeps in between the cracks in our protective armour, makes itself at home and begins poisoning us from within. Just as the internet similarly carries maladies, sneaking under our radar, finding loopholes in our antivirus software. The origin of sin is in our hearts and minds. Our minds are extremely clever at adopting thoughts, behaviours and habits into our subconscious nervous system, so that we need not have awareness of every single function. Scientific research shows that approximately 95% of our day-to-day functioning is directed by our subconscious rather than in our scope of awareness. That is a scary thought! For we are not as in control as we may like to think. This is a major reason as to why the spiritual audit is so vital. Who remembers being told as a child “you are who you hang with”. This common saying has been a way for parents to warn children for many generations. Warning us that those we spend time with can influence us to think and behave like our friends do. In order to understand how we have becomes spiritually hacked, and how these Inner Enemies of sin creep in, we can consider Brain Entrainment. “Entrainment is a principle of physics. It is defined as the synchronization of two or more rhythmic cycles. The principles of entrainment appear in chemistry, neurology, biology, pharmacology, medicine, and more.” (Neuro programmer 3). Entrainment is a method utilised in group meditation, as our brainwaves settle into Alpha and Theta frequencies during meditation. These frequencies are transmitted among the group, syncing up with the brainwaves of all, and helping those who usually have trouble meditating on their own, to calm their mind and reach that highly sought after relaxed state. Lets consider the enemies of sin whirring all around us, in the shows we watch, on the radio, on social media, in the music we listen to, the environment around us, and even in the behaviours and thoughts of the company we keep. Through entrainment our brainwaves pick up these rhythmic cycles and our brain chemicals can actually change to synchronize with them. We begin to have thoughts and beliefs we didn’t have previously, or begin to mimic behaviours without our conscious consent. We see evidence of this when women’s cycles sync up, or when we witness a hearty and contagious yawn. These prolific enemies are not just aimless wandering entities of sin, these are determined villans, adversaries of God. Malicious and intentional. Our ignorance only encourages and empowers them. Infiltrating us and the world round us. Self-awareness and the willingness to Spiritually audit ourselves, a close relationship with our Messiah through the Word, and the integrity of the armour of God, are our best form of antivirus! 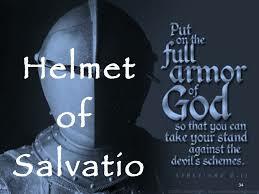 By developing the armour of God we can obtain the Helmet of Salvation and protect our precious minds from adopting the sinful influences of the world around us. In this way we do not need to avoid the world, nor withdraw from it and the abundance of sin, we can overcome it! Amen!